Last month at our Ignite conference in Orlando, we proudly announced the public preview of Azure Digital Twins, a new platform for comprehensive digital models and spatially aware solutions that can be applied to any physical environment. Today, we take the next step in the journey of simplifying IoT for our customers and are happy to announce that Azure Digital Twins is now officially live. Starting today, customers and partners can create an Azure account and begin using Azure Digital Twins. We encourage you to explore the content available in the Azure Digital Twins documentation and on the product page. You can also try out the quickstart to begin building your solution with Azure Digital Twins today. Spatial intelligence graph: A virtual representation of a physical environment that models the relationships between people, places, and devices. This digital twin generates insights that allow organizations to build solutions that can improve energy efficiency, space utilization, occupant experience, and more. This includes blob storage, the ability to attach and store maps, documents, manuals, and pictures as metadata to the spaces, people, and devices represented in the graph. The image below provides a simple visual of what this graph could look like, and how it provides a hierarchical and layered approach that virtually represents a physical environment. Twin object models: Azure Digital Twins also offers pre-defined schema and device protocols that align to a solution’s domain-specific needs to accelerate and simplify their creation. These benefits can apply to any interior or exterior space, as well as to infrastructure or even entire cities. Azure Digital Twins is applicable to customers that work with any type of environment; whether it be a factory, stadium, or grid. The twin object models are what enables this by allowing the graph to be fully customizable to align to the different needs of solutions. Advanced compute capabilities: Users can define functions that generate notifications or events based on telemetry from devices and sensors. This capability can be applied in a variety of powerful ways. For example, in a conference room when a presentation is started in PowerPoint, the environment could automatically dim the lights and lower the blinds. After the meeting, when everyone has left, the lights are turned off and the air conditioning is lowered. Data isolation via multi- and nested-tenancy capabilities: Users can build solutions that scale and securely replicate across multiple tenants and sub-tenants by leveraging built-in multi- and nested-tenancy capabilities to ensure data is isolated. Microsoft doesn’t want to compete in the application layer, but instead enable others to build on top of the Azure Digital Twins platform. The full multi and nested tenancy model enables organizations to build and sell to multiple end-customers in a way that fully secures and isolates their data. Security through access control and Azure Active Directory (AAD): Role-Based Access Control and Azure Active Directory serve as automated gatekeepers for people or devices, specifying what actions are allowed—and helping to ensure security, data privacy, and compliance. Integration with Microsoft services: Customers and partners can build out their solution by connecting Azure Digital Twins to the broader set of Azure analytics, AI, and storage services, as well as Azure Maps, Azure High-Performance Computing, Microsoft Mixed Reality, Dynamics 365, and Office 365. The integration with these services enables customers to build end-to-end best-in-class IoT solutions. Azure Digital Twins has the power to shift the paradigm in IoT. Some customers and partners, from a wide range of industries and backgrounds, are already leveraging the potential of next generation spatial intelligence IoT solutions. 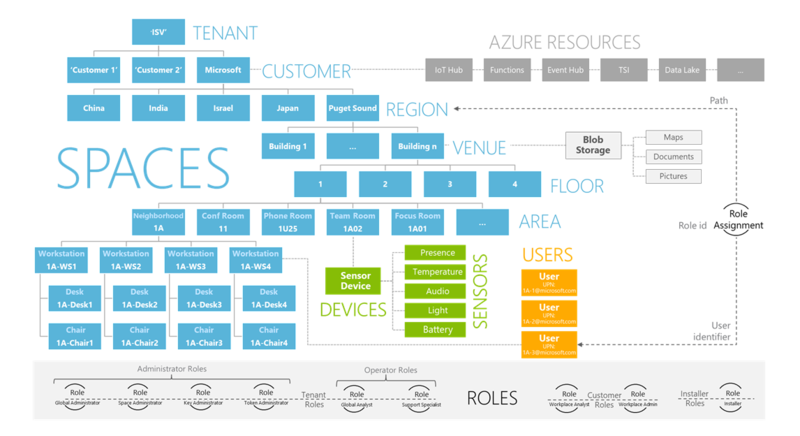 To provide concrete examples of how partners are packaging the capabilities present in Azure Digital Twins to create digital twins of physical environments, below are images of what finished solutions can look like and how they can be visualized. These impressive images are examples of UIs of solutions built on Azure Digital Twins, but the impact that these created is even more inspiring. We encourage you to dive-deep into the existing customer stories to understand more. For more information we have included a video below that explains the key capabilities and value proposition of Azure Digital Twins in further detail. We look forward to continuing to deliver on our commitment of simplifying IoT for our customers and are excited about the role Azure Digital Twins will play in our customers’ digital transformation journey. Try out the quickstart to begin building your solution with Azure Digital Twins today. Please provide feedback and suggestion on how we can improve. We value your input and are constantly looking for ways to address our customers’ pain points and needs.